In the year that Vic has been selected as the Cultural Centre of Catalonia, it has been the host for the fifth successive year of one of the world’s most individual Music and Dance Festivals; the Festival Internacional de Música de Cantonigròs a Vic. Now in its 34th year, the Festival has become an indisputable part of Catalonia’s cultural heritage as well as being an event which brings many people and nationalities to Vic each year. During the Festival itself, Vic’s importance as a specifically Catalan cultural centre could almost seem eclipsed at times by its significance as being the focal point of a global gathering and celebration through the Festival’s Music and Dance competitions and concerts which bring in an audience not only from the locality but throughout Catalonia and beyond. At the same time however, the importance of having a centre such as Vic as the Festival’s home cannot be underestimated so it is worth considering therefore this city’s distinctive personality in order then to grasp the special chemistry which emerges during the four days in July of each year as the Festival’s intense schedule unfolds. The ancient settlement of Vic dates from Roman times and was known as Ausa, and by the Visigoths as Ausona, and from that root is surely derived the present day ‘Osona’ which is the name given to the surrounding area which including Vic, of which the older form Vich, can still be seen at various points around the town. There are a number of important festivals taking place in Vic each year which confirm the town as an important Catalan cultural centre. The Mercat Mediaeval de Vic (The Catalan word ‘Mercat’ means Market or Trade) recreates mediaeval times though music and street plays and the Mercat de Musica Viva de Vic brings many to Vic each year for this lively celebration of all kinds of music. Vic also has a thriving University, one of the youngest in Catalonia but one which has already proved itself to be the most important outside the four major cities of Catalonia. There is also the well-known Episcopalian Museum and the museum of Leather Goods. The Seminari de Vic is testimony to Vic’s previous significance as a centre for those training for the priesthood. These days its many rooms are used for accommodating visitors to Vic, whether tourists or visitors to conferences and it is used extensively during the Festival to accommodate both visiting groups and the large groups of volunteers. The nearby village of Cantonigròs was the Festival’s home from its inception in 1982 until 2012 when the Festival’s President, Josep María Busquets proposed a move to the Atlàntida theatre in nearby Vic since when it has been home to the Festival. The Festival’s distinctive character was established in this tiny village of some two hundred inhabitants set amongst the spectacularly scenic mountainous surroundings above the Plana (Plain) de Vic. Modelled on the idea of the Welsh Eisteddfod and taking the famous Welsh International Eisteddfod at Llangollen as its inspiration, much of the Eisteddfod ethos was incorporated into the Festival from the start. This has been evident not least in the remarkable cohort of volunteers drawn initially from Cantonigròs and nearby who, in keeping with the Welsh tradition, has provided hospitality and ‘hands on’ help for many years. However, this has now been extended in order to include members of youth organisations from all over the world, who, equipped with an impressive range of language and communication skills, choose to come and work at the Festival from year to year. These combined groups of volunteers are a major key to the Festival’s continuing survival and success in preserving its individual character and ethos. All through the year, a small but highly dedicated staff work in the Festival Office whilst others complete the ranks of the key posts of whom a significant number is drawn from the Busquets family. All highly skilled professionals in their own fields, the family members work closely together with the Office team and those heading the various areas of responsibility. Combining their forces with the other volunteer staff members during the Festival itself, they bring a profound understanding of the Festival’s ethos to their work, achieving more together than would most teams of double the size. What also marks out this Festival amongst many however, is that it remains the only Festival which has membership of the EAF (European Association of Festivals) and yet is completely run by voluntary support. 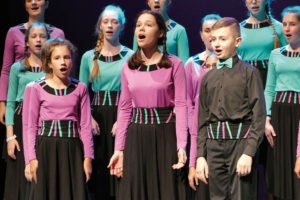 It is therefore a wholly amateur Festival within an association which has amongst its members such prestigious Festivals as Salzburg, Lucerne and Flanders. This is not only a very high distinction confirming the prestige of the Festival Internacional de Música de Cantonigròs a Vic in the eyes of the Festival world but in equal measure it is also a remarkable human testament to all that can be achieved through many years of unstinting voluntary work and support. 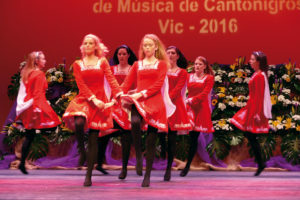 In order to match the level of the groups that the Festival was attracting, a move to the Atlàntida theatre in nearby Vic was announced for the Festival’s 30th Year in 2012 and its name was formally changed to Festival Internacional de Música de Cantonigròs a Vic. Despite leaving the rural surroundings of Cantonigròs, the Festival quickly adapted to its new home with its characteristic spirit. Equipped with two excellent auditoriums, with a concert series featuring some of the world’s top performers as well as popular local artists and home to a Music School, this prestigious theatre has proved to be a wonderful venue for the Festival which in its turn has proved itself to be much more than simply a Festival but a true global centre resulting in what can only be described by one of those truly special Catalan words Convivència. The word can be translated simply as ‘living together’ but its true meaning within the context of these four days each year is to be found within the original ideals of the Festival’s founders as conveyed each year in the words of the Festival’s President, Josep María Busquets. He speaks of ‘the sharing of cultures and traditions between nations by means of the language of music thereby opening up a dialogue of understanding and peace.’ From the initial warm welcome given to the Festival from the Ajuntament (City Council) of Vic, the Atlàntida and the people of Vic itself, the Festival has become an important and highly prized event in the town’s calendar. This year’s Festival, which ran from 14th-17th, July saw a wonderful range of choirs and dance groups visiting Vic. The prizes for the five competitions were generously donated by the Generalitat (Government) de Catalunya, Ajuntament de Vic, the Institutió Puig Porret and the Festival itself. There was a high level of performance in all the competitions and the evening concerts. The Inaugural Concert featured a number of the participating choirs and dance groups including the remarkable Catalan Vocal Quartet, Melt. These four young men and women who were recently discovered when they won a talent contest on the Catalan TV3 channel, left their Cantonigròs audience truly spellbound by the ease with which they effortlessly moved from traditional folk songs to contemporary works of considerable technical complexity, all sung with pinpoint accuracy and true aplomb with choreography to match. 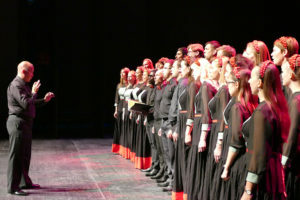 The First Prize in the competition for Mixed Choirs was won by the Cantemus Choir of Hungary. This highly disciplined choir had a fine tone quality, great dynamic range and a generous range of sonorities. The women of the Cantemus Choir of Chisinau, Modavia, made a powerful impression with the beauty and accuracy of their performances for which they were awarded the First Prize in the competition for Female Choirs. The intimate style of the APZ Tone Tomsic Choir of the University of Ljubljana, Slovenia, was both telling and notable in its versatility in a wide range of styles and for its intelligent and sensitive musicianship. This choir was awarded the First Prize in the Folk Music competition. The Dance competition was won by a distinguished group from Northern Ireland, the Folk Dancers of Loughgiel. The dancers demonstrated a complete unanimity of style and ensemble over a wide range of styles, mainly folk, but branching out also into crossover works with the accompaniment of a more complex musical score. Great credit was also due to their highly accomplished band of which one member, an accordion player gave a most moving rendition of an unaccompanied folk song which came to be regarded as a festival highlight. Once again, the highly rousing Festival Hymn which rounded off the Festival amidst the throwing of flowers and many embraces between participants and audience, left one in no doubt as to the true extent of the realisation of its founders’ shared vision in achieving that ‘dialogue of peace, knowledge and understanding between people’. The Atlàntida Theatre and indeed Vic can be proud to host an event such as the Festival Internacional de Cantonigròs a Vic. In turn the Festival brings to Vic a flame of hope for the future in showing just what a Festival can achieve if given such an inspired and altruistic vision on which to build. More than the sum of its parts and surely much more than a Festival….